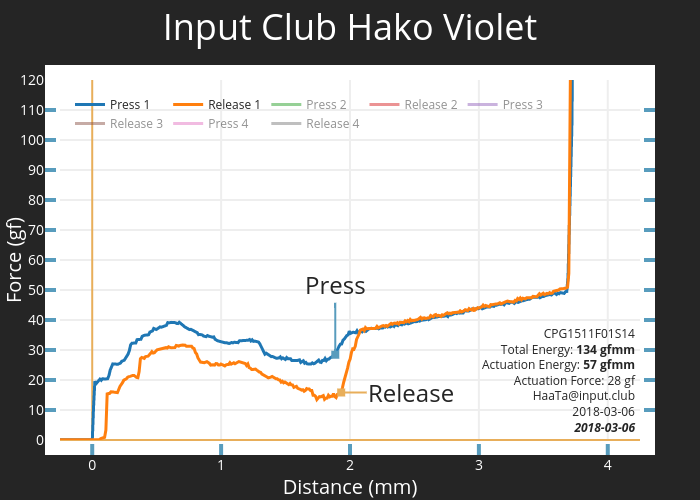 Hako Violet switches, designed by Input Club, use lighter springs due to feedback from the keyboard community. Elements from Cherry MX Clear and Topre are combined with less resistance to create a comfortable switch for smooth typists. Precision molds and tooling from Kaihua made the switches last 25% longer than regular MX variants during stress testing. In addition, the bespoke slider design virtually eliminates wobble. Community enthusiasts Jacob Alexander (HaaTa) and Brandon Muzzin (Over^Kill) designed custom springs and sliders for the Hako line. Hako Violets use a light spring and have a peak tactile point of (approximately) 40 grams. Tactility occurs early in the key press. A 10 gram post-tactile cushion, in the form of a resistance ramp, reduces bottom out harshness.